Space shuttle Endeavour's final undocking from the International Space Station (ISS) is the focus of attention today for the crew on both vehicles after more than 11 days of joint docked operations. 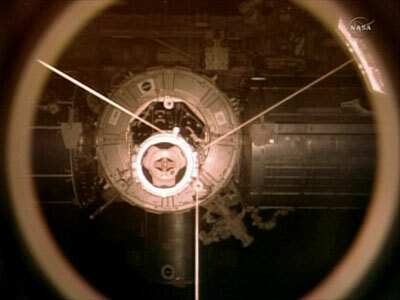 Undocking of Endeavour from Pressurized Mating Adapter 2 is scheduled for 10:55 p.m. CDT, with pilot Greg Johnson at the controls on the aft flight deck. He'll maneuver the shuttle out in front of the station and then guide the vehicle to fly around the station so mission specialists Mike Fincke, Roberto Vittori, Drew Feustel and Greg Chamitoff can photo and video document its condition, before Johnson fires Endeavour's thrusters to move behind the station. From there commander Mark Kelly will take over to fly a re-approach to the station for a Detailed Test Objective (DTO), or flight test, known as STORRM (Sensor Test for Orion Relative Navigation Risk Mitigation). Feustel will monitor the sensors while Kelly flies the shuttle back to the vicinity of the station to test an automated docking system that uses a vision navigation sensor flash LIDAR. The system is being developed for use on future spacecraft including the multi-purpose crew vehicle and the recently approved OSIRIS-REx asteroid sample return mission. After the STORRM test is complete, Kelly will fire Endeavour's jets for a final separation maneuver. Expedition 28 commander Andrei Borisenko together with flight engineers Alexander Samokutyaev and Ron Garan will monitor the shuttle activities and conduct their daily exercise sessions before enjoying an extended sleep period to get back on their regular schedule by Tuesday morning. Today's wakeup song, "Slowness," at 6:27 p.m. Sunday, was for Kelly. "Good morning Houston and good morning Tucson, Arizona as well," said Kelly. "That song is from a band named Calexico from my wife Gabby's hometown. They are from Tucson, Arizona as well." "It's about two people on a trip reaching across a distance. It references places like Signal Hill and Gate Pass in Tucson. I know she really, really wants to get back there and is really looking forward to that." "So it is an appropriate song because that's coming soon," said Kelly. The spacecraft that installed the first and last of the U.S. components for the International Space Station (ISS), space shuttle Endeavour departed the orbiting laboratory for a 12th and final time today. STS-134 pilot Greg Johnson was at Endeavour's aft flight deck controls as the shuttle separated from the Pressurized Mating Adapter-2 (PMA-2) located on the forward port of the station's Harmony node. "We have physical separation," radioed STS-134 commander Mark Kelly. "Endeavour departing," announced ISS Expedition 28 flight engineer Ron Garan, as he rung the station's ship bell, continuing a tradition borrowed from the Navy. "Fair winds and following seas, guys." "Thanks Ron, appreciate all the help," replied Kelly. "It was a pleasure serving with you boys," said Garan. The shuttle undocked on schedule at 10:55 p.m. CDT Sunday, after 11 days, 17 hours and 41 minutes attached to the station. Endeavour and the station were flying 215 miles above and over La Paz, Bolivia when they parted ways. Johnson will fire Endeavour's jets to separate the shuttle from the station to a distance of about 400 feet where he'll begin a 360-degree flyaround of the orbiting laboratory. Following the fly around, commander Mark Kelly will pilot Endeavour on a re-rendezvous maneuver that will return the shuttle within 600 feet of the station as part of a first-of-its-kind flight test, the Sensor Test for Orion Relative-navigation Risk Mitigation, or STORRM. Endeavour's first mission to the space station, STS-88, its 13th mission, was the first of the shuttle program's space station assembly missions. Over the 11-day, December 1988 mission, Endeavour's astronauts joined the first U.S. and Russian pieces of the budding orbital laboratory, Unity and Zarya. 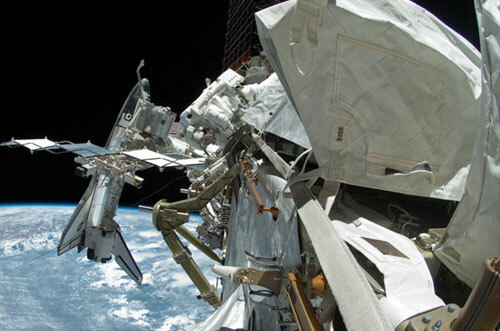 On its 11 subsequent visits to the station, Endeavour lifted components of the solar power system, Japan's Kibo module, supplies, research gear and astronauts assigned to live and work on the station. On this mission, its final flight, Endeavour brought the Alpha Magnetic Spectrometer and ExPRESS Logistics Carrier-3, the last of the United States' contributions to the orbiting outpost. 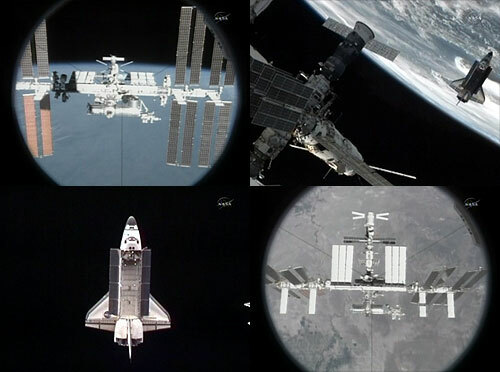 STS-134 pilot Greg H. Johnson began guiding space shuttle Endeavour through a flyaround of the International Space Station at 11:20 p.m. CDT, giving his five crew mates the chance to visually survey the complex and see the Alpha Magnetic Spectrometer and ExPRESS Logistics Carrier-3 that they delivered and installed. "As we come up on about our 200th sunrise of the mission, we can see clearly AMS on station and ELC-3," radioed commander Mark Kelly to Mission Control in Houston, Texas. "Just want to congratulate the whole team on the ground and the Expedition 27 and 28 crews for all the hard work that you guys have put into this. We're the ones who get to see this incredible view, but you are all with us in spirit." "This is really a new day for science aboard the space station," he said. The flyaround also provided the final views of Endeavour flying in space, as captured by cameras on the station. Following the flyaround, Kelly will fly Endeavour through a re-rendezvous maneuver that will return the shuttle within 600 feet of the station as part of a first-of-its-kind flight test for future spacecraft, the Sensor Test for Orion Relative-navigation Risk Mitigation, or STORRM. At 12:26 a.m. CDT Monday, nearly two hours after undocking, a second firing of Endeavour's engines that would normally have taken the shuttle further away, served as the first maneuver to bring Endeavour back to the vicinity of the International Space Station (ISS) for the Sensor Test for Orion Relative-navigation Risk Mitigation, or STORRM. Commander Mark Kelly is piloting Endeavour for this re-rendezvous. STORRM is examining sensor technologies that could make it easier for future spacecraft, including the Orion-based multi-purpose crew vehicle (MPCV), to dock to the station. The same sensors will be employed for a newly-approved asteroid sample return mission, OSIRIS-Rex. STORRM's visual navigation system provides an image of the ISS using an eye-safe, flash lidar system that operates very much like a stop sign reflecting headlights. On the station's docking port are specialized retro reflectors — made from material similar to that used on stop signs — that bounce light back with minimal scattering. The lidar targets the retro-reflectors, which were added to the ISS during Discovery's STS-131 mission in April of 2010, to calculate the range and line of sight angle measurements that the system then provides to the relative navigation software. Endeavour approached the station to a point 950 feet below and 300 feet behind the station at its closest. "All right! Did you bring more ice cream?" responded Expedition 28 flight engineer Ron Garan from on board the station. "Nah, you've got all of that," said Kelly. Developed by the Orion Project Office at the Johnson Space Center in Houston, Texas, together with NASA's industry partners Lockheed Martin and Ball Aerospace, the STORMM visual navigation sensor and docking camera will advance the capability needed for automated rendezvous and docking. STORRM is being performed to gain a thorough understanding of the new sensors' performance in space to validate ground simulation models and properly characterize sensor performance. At 3:38 a.m. CDT, space shuttle Endeavour fired its jets to complete the final separation from the International Space Station (ISS), setting it on its course for return to Earth on Wednesday, June 1. Endeavour will begin to increase its distance behind the station with each trip around Earth. The shuttle's re-rendezvous with the space station, the Sensor Test for Orion Relative-navigation Risk Mitigation, or STORRM, was completed as planned, with commander Mark Kelly flying Endeavour to an approach within about 950 feet of the ISS as the systems visual navigation system was tested.